Building on the success of man-made recreational fishing reefs for boat-based anglers in Port Phillip Bay, The Victorian Fisheries Authority has created three new reefs for shore-based anglers. The three reefs have been funded by recreational fishing licence fees and were completed in spring 2012. 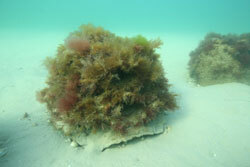 The new reefs are in a water depth of between 3-4.5 metres, approximately 40 metres seaward of Frankston Pier, and 40 to 70 metres seaward of Portarlington Pier's rock-wall section and the end of Altona Pier. These locations were chosen based on their environmental and physical attributes and following consultation with angling representatives, local councils and other government agencies. 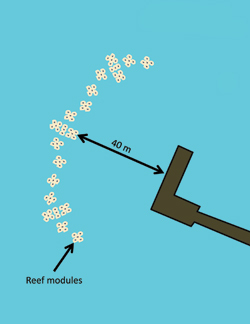 Each reef consists of 99 hollow dome shaped reef modules of different sizes arranged in three reef complexes of 33 reef modules each. 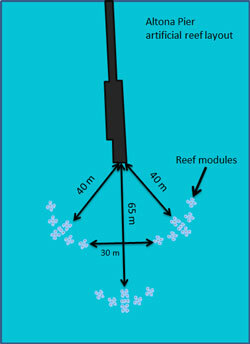 The reef modules range between 170 and 340 kg in weight and 50 to 60 cm height, and have numerous external openings to allow movement of currents and fish through the modules. 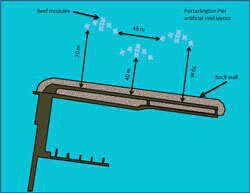 By positioning clusters of reef modules within casting distance from these piers, fish species targeted by shore-based anglers will become more available. The reefs will also provide habitat for a range of other plant and animal species there bye increasing local biodiversity. angler use, catch rates and satisfaction. This video shows the development of the Frankston Pier artificial reef. 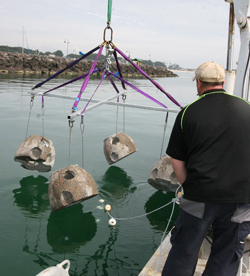 The reef is made of approximately 100 concrete modules that were deployed about 40-50 m off the end of Frankston Pier in November 2012. The video is taken by a baited under water video (i.e. a remote video camera with a bait cage) which is used to monitor the development of the fish communities on the reef over time. The video shows how the reef community develops from bare sand with few fish prior to reef deployment to algal covered reef modules with abundant fish life as such juvenile snapper and leather jackets, and also calamari squid one year after deployment. Similar reefs have been deployed off Portarlington and Altona Piers, thanks to funding from Recreational Fishing Licence Fees. Please note there is no sound in this video.